GoXtra News: International Icon Brenda Fassie Comes Back to life! International Icon Brenda Fassie Comes Back to life! And Bongani Fassie is super HAPPY! South Africa's Brenda Fassie died nine years ago since then South Africa is still missing the beloved icon! On the 23rd this month the Hansa Festival of Legends will bring MaBrrr back to life in a hologram form. This is the first holographic project done in Africa and if you recall it was once done to the well-known rapper Tupac. So it’s time for South Africa to shine once again as the historical country in Africa. Dubbed the “Madonna of the townships” by Time Magazine and known to many as MaBrrr, she thrilled and entertained the audience with her dance moves and hit songs that were and still love by many South Africans and international fans. Now, she will be brought back to life on the 23rd of March through a holographic performance that will enable a three dimensional image to be made of the pop queen. The life like images will be made possible through lasers and sophisticated lighting that comes together to form an image. 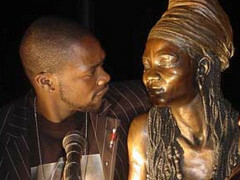 In a press statement her son Bongani Fassie said it has been always his dream to perform with her mother again. “I feel good about what I/we are doing for my late mother and I am truly grateful.” Said Bongani Fassie. Bongani told the Entertainment-Home that he had no idea this would happen. When asked if he won’t be emotional and cry – “I cannot spoil the show for the audience, but if you come to the show and see... LOL!” said Bongani. He told us that the show will not affect him in a negative way but he just misses his mother and he does cry but only tears of joy. “Thanks to the Hologram, it will look like Brenda herself is taking control of the stage in her trademark disco queen.” said Khensani Nobanda – of Hansa. Other special Kwaito tribute will be performed by Arthur Mafokate, Mdu, Thebe and Spikiri. Hip Hop rapper and Metro FM award winner, Khuli Chana. The 10 hour festival will take place once again at the Mary Fitzgerald Square in Newtown.